The strong silent type, that’s you. But must you be silent, too? Doesn’t vexation make you voluble? or two. Let us sound some brass! though it may be overly. then reject me, if you must. You can’t believe the storms we’ve been having. The rain poured down in sheets, making ponds out of the potholes in the streets until I half-expected to see tadpoles swimming at the intersection of Polk and McAllister. I tried to take a walk the other afternoon, but the wind was so strong that it bent the treetops like a good old-fashioned Iowa tornado. The only way I could make any progress at all was to walk sideways, making myself as thin as possible. People here say it’s what winter in the Bay Area is supposed to be like. Some even welcome a deluge like the one we had the other day. I suppose a climate where it never rains from Easter to Thanksgiving can make a body a bit nervous. Miss a couple of months’ precipitation, and it’s all over till next year. Nevertheless, I kept thinking of that old song — “The rain may never fall till after sundown. By eight, the morning fog must disappear.” That’s not the case in this Camelot. Here the rain may never fall until November, and then it doesn’t stop for clock or royal edict. And the morning fog… There are days when you’re lucky to see the sun in time for sunset. Do I sound grumpy? I’m really having a wonderful time, only there are mornings when my coat is still soggy from the night before and my shoes are so perpetually damp that I keep looking for signs of sprouting mushrooms. The only thing that makes this misty misery bearable is the days in between, when the sun shines brilliantly and the city is washed clean. The buds on the plum trees start to swell — yes, in January — and the gray-green branches of the acacias grow heavy with yellow flowers. There’s a mockingbird that likes to perch outside my window early in the morning. He imitates every bird in the neighborhood, one by one, stops for a moment, and then goes through entire repertoire again in exactly the same order. The place to go at this time of year is the beach. Not to sunbathe. Not to swim, although the temperature of the water is scarcely colder than it is in August. Serious surfers are out there year-round, wearing not only chin-to-ankle wetsuits but even bonnets to ward off hypothermia. I stuck my hand into the edge of a wave, just to see what their habitat felt like. My fingers didn’t quite turn blue, but the tips were numb for several minutes after I jammed them back in my pockets. A trip to the beach in January is not for the faint-hearted. If you want sun and warm sand, you’re better off in Hawaii. This is the season when bay and ocean declare their might, making it clear that no human engineering can tame them. The summer winds on the bay blow more fiercely, habitually reaching velocities that would force the America’s Cup to close down shop for the day. But winter storms roil the waters. And when a full moon draws the tide exceptionally high on the shore, as it did this week, a visitor can only tread carefully and beware the power of the sea. My new friend Simon took me to Aquatic Park on Wednesday afternoon. As usual, his black garb contrasted with the colorful clothes of the people around us, but on this particular day he seemed less conspicuous, more like a terrestrial counterpart of the seal that was bobbing out near the breakwater. We sat on the cement steps near the Maritime Museum, drinking cappuccinos and watching a flock of seagulls occupy the harbor. I think you told me the steps were there at the turn of the century, when you visited San Francisco, and the museum was a remnant of the 1930s. The city has refurbished it, adding a deck with a lookout tower, but it still houses a wonderful collection of photographs and seamen’s belongings. As we followed the progress of a swimmer, moving determinedly from the Dolphin Club to Fort Mason, Simon reminded me that European explorers had plied the California coast for two centuries before a gap in the fog revealed the presence of this bay. I wonder if they felt stupid for missing it. Or just relieved that they now had one more harbor to conduct their business in. I’ve seen photographs taken in the middle of the 19th century, where sailing ships crowd the area, their masts black and straight like tree trunks in a burned-out forest. Can you imagine the clatter that the rigging of 5,000 ships must have made? And what a nuisance it must have been, in 1849, when entire crews jumped ship and headed for the gold fields, leaving their vessels to rot in the water. The folks who stayed in town made good use of the abandoned hulls, though. They hauled them in to shore and piled them every which way, taking advantage of the salvage to create landfill. I guess you could say that the early city of San Francisco rested both literally and figuratively upon the maritime trade. Even in the rain, small ketches were tacking back and forth in front of us. Simon told me that, at the beginning of the 21st century, the city nearly lost its waterfront. The bay was lined with old, dilapidated piers that had apparently lost their usefulness. The Port Commission began accepting bids to develop them. A waterside strip mall at Pier 39 had already led the way, but by the beginning of the new millennium, the still barely active Fisherman’s Wharf was in danger of disappearing in the new construction. There were plans for a hotel here, a retail complex there, even a San Francisco history theme park and a high-priced sports complex. But Adam Smith’s invisible hand reached out and pushed the stop button. The economy went sour, and interest in anything-goes development evaporated. Now the waterfront is bustling, but tourists walk there warily, lest they interfere. Cruise ships call on their way down the coast or out to sea. Ships laden with logs from the Northwest tie up farther south, near the railroad terminus. 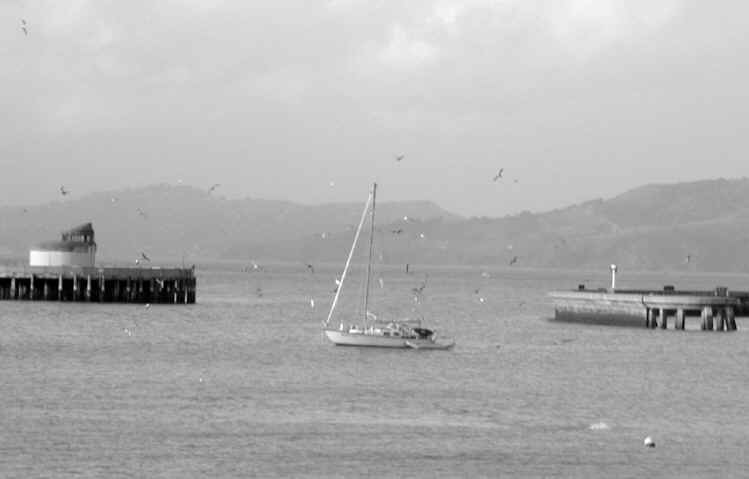 Simon told me that, in fairer weather, this part of the bay is filled with windsurfers and tiny boats enjoying the excitement of sailing across the Golden Gate. Fishing boats tie up at the Wharf and the Hyde Street Pier in record numbers, their brimming holds a testimony to years of clean-up efforts by local environmental organizations. A few days later, I paid a visit to the Powell Street Fish Market, where piles of crabs and oysters sold for half their supermarket price. As we left the beach, the weather grew fierce. Heavy clouds hovered overhead. I found myself thinking nostalgically of crisp snowy fields outside Des Moines. We caught a cable car and headed downtown, arriving just before another torrent of rain. Simon walked me to my hotel, silent, obviously considering something. He’s a strange man, with moods that are hard to read. As we reached the entrance, he stared at me for a minute. I said yes, puzzled. He refused to say anything more. On Friday morning he appeared at precisely 8:00, behind the wheel of a ShareCare. We drove down the coast to Pacifica, where the newspaper said the waves had been especially fierce. They still were. 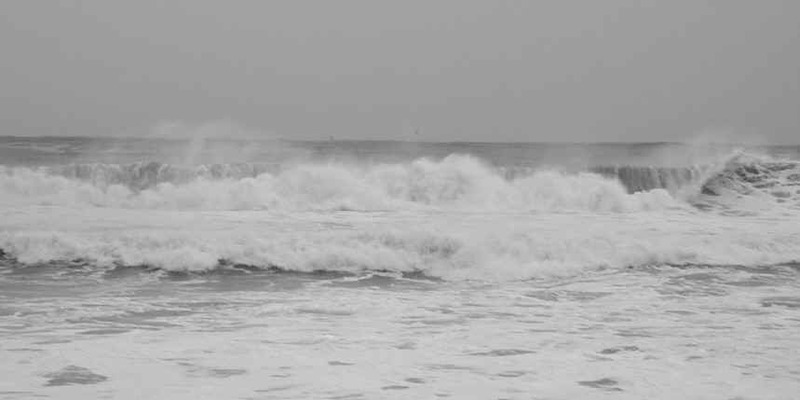 As we stood at the upper edge of the sand, the ocean drew back, rising 20 or 25 feet like a rearing stallion. Waves broke high on the beach and left behind debris, spread out in neat arcs. One wave thrust through the narrow entrance to the parking lot, spewing a giant tree trunk of seaweed and a decomposing seal’s carcass onto the pavement. 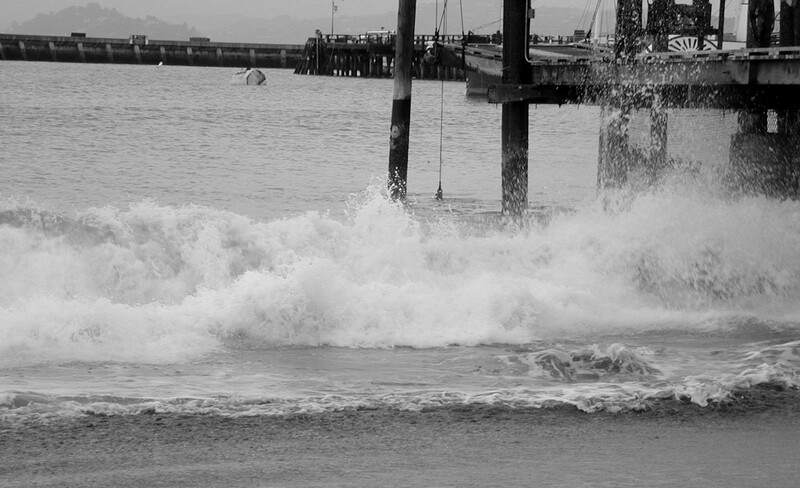 If either of us had felt like talking, we would have had to shout over the roar of the surf. But there are times when words feel inappropriate. This puny pair of humans knew when to keep quiet. Then the wind came up, bringing more rain. Something sharp stung my face. Hail. Simon took my hand and pulled me across the sand toward the car. We climbed inside, panting and dripping wet, exhausted, spent.